If you are an Android phone user and never purchased any premium app just because of high price of the apps then it’s the right time to try premium apps and that’s at 90% discounted price. Yes you heard it right. Google is celebrating 10 Billion Promo in Android Market and you can get 10 premium apps for just 10 cents or Rs. 5.13. I came to know about this promo today when I opened the Android Market in my phone and its main page was flashing a banner of 90% off on 10 premium apps. I immediately downloaded some of the apps. 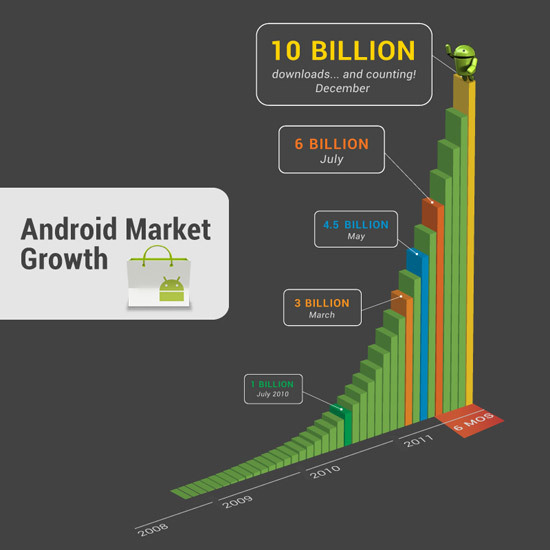 This past weekend Android Market exceeded 10 billion app downloads. To celebrate this milestone Google has partnered with some of the Android developers who contributed to this milestone to make a bunch of great Android apps available at an amazing price. This promo starts today and it will continue for next 10 days. A new set of 10 apps will be available each day. The best among these premium apps is Asphalt 6 HD. It’s an awesome game for your smartphone. You must try this game. So what are you waiting for? Click here to start downloading top premium Android apps at 90% discounted price. How many of you downloaded these premium apps and which apps you downloaded? Thanks for the information. I just bought Asphalt 6 HD.